AUTHORS: Morgan Fraser, Cosimo Inserra, Anders Jerkstrand, et al. When the supernova impostor SN2009ip brightened to a V-band absolute magnitude of -17.7 near the end of 2012, the outburst was classified as a Type IIn supernova and many observers thought the star had finally exploded for good. In this paper, however, the authors present several months of multiband imaging of transient 2012b and argue that the low limit on the nickel mass and lack of most heavy elements in the ejecta suggest the progenitor is still around, and that transient 2012b was produced instead by the collision of two massive shells of ejecta. The “SN” in object SN2009ip might stand for “supernova,” but shortly after its discovery astronomers realized it was something stranger: a supernova impostor, a bright transient that looks like an explosion but doesn’t destroy its progenitor star. Supernova impostors are often linked with a type of massive star called a Luminous Blue Variable, extremely bright stars with high surface temperatures that routinely undergo irregular eruptions. 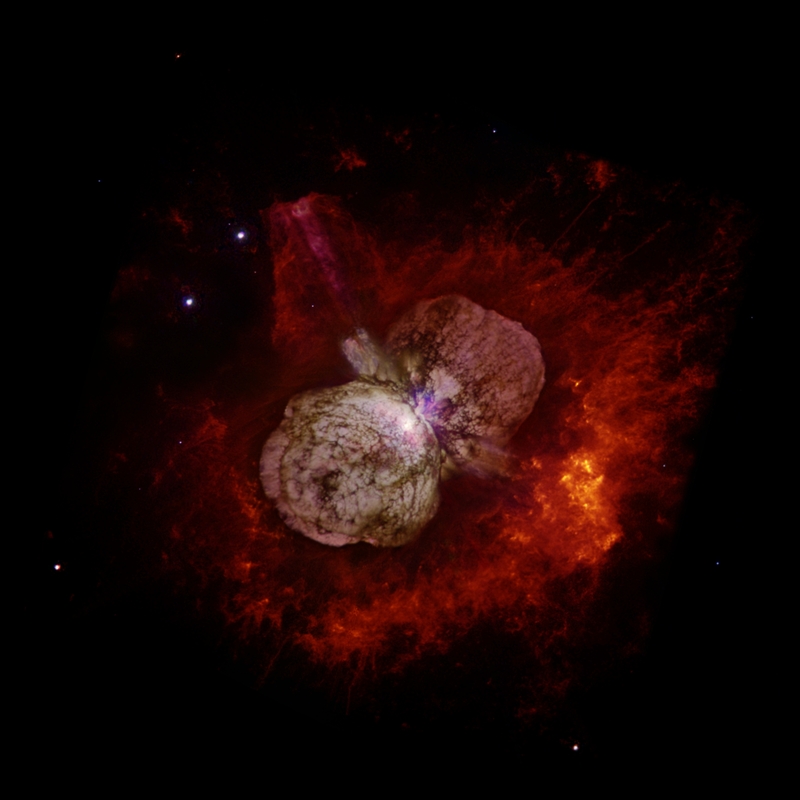 The most famous LBV is the heavier star in Eta Carinae, which underwent a huge eruption in the 1800s that ejected several solar masses’ worth of material and formed the Homunculus Nebula. HST imaging in 2009 that caught the progenitor of SN2009ip was good enough to classify it as an LBV. SN2009ip has an impressive rap sheet. After the original transient in 2009, it continued to produce irregular outbursts for the next three years. In early 2012 it rapidly brightened to a V-band (visual) absolute magnitude of -14 (transient 2012a), faded somewhat, then re-brightened to a V-band magnitude of -17.7 (transient 2012b). For comparison, the Milky Way is estimated to have an absolute V-band magnitude around -20.5. 2012b’s high integrated energy, on the order of 1049 ergs, and high velocity ejecta, up to 15,000 km/s, made observers suspect the star might have finally exploded for good. The transient was classified as a Type IIn supernova – “n” for “narrow,” indicating that the spectrum showed narrow emission lines. These lines indicate the presence of slow-moving material, and are usually interpreted to mean that the SN ejecta is colliding with a dense circumstellar medium. Type IIn supernovae are rare, representing only 4 – 9% of core-collapse supernovae, and are linked to LBVs. Because an LBV throws off a shell of material with a different mass and velocity in each outburst, their final deaths occur in very messy environments. Imagine trying to model an explosion colliding with the Homunculus nebula around Eta Carinae. The authors present many months of spectra of transient 2012b in the optical, UV, and NIR, showing multicomponent, evolving emission and absorption profiles in H and He. Heavier elements such as Ca and Na show up at late times. These spectra suggest the transient occurred in a dense and complex CSM containing shells of material from previous outbursts. However, the authors see no evidence in SN2009ip’s spectra for elements like oxygen that are made in the late stages of stellar evolution or, more importantly, heavy radioactive nuclei like nickel-56 and its decay product cobalt-56. The presence of heavy iron-peak nuclei in ejecta is a key signature of a supernova. After the initial outburst fades, the decay of these radioactive isotopes powers the lightcurve of the supernova and falls off in a steady decline called the decay tail. 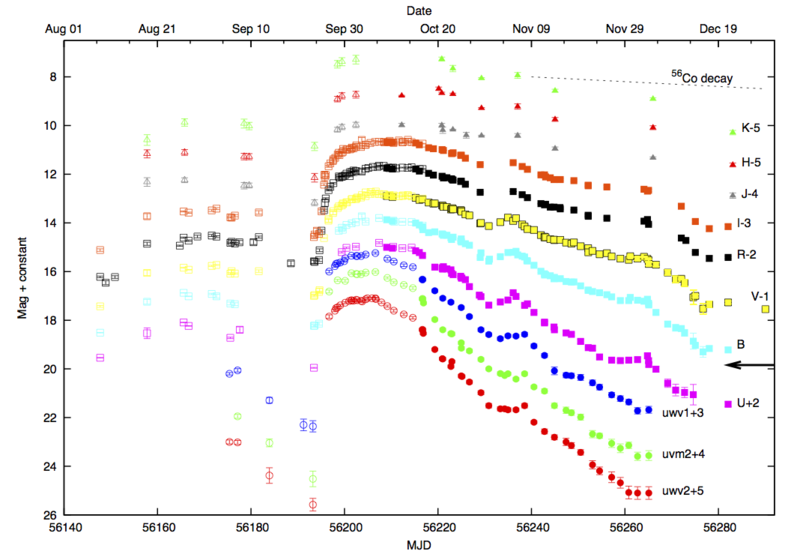 But the lightcurve of 2012b seems to be dimming much faster than a decay tail powered by nickel-56 or cobalt-56 should. The authors put an upper limit of 0.01 – 0.02 solar masses of nickel in the ejecta, when the explosion of an LBV of the mass estimated for 2009ip’s progenitor should have made anywhere from 1 to 8 solar masses’ worth. This suggests that 2012b wasn’t a core-collapse supernova at all, but rather another particularly violent outburst from the progenitor star. Lightcurves of SN2009ip in various bands. Round points are UV, square are optical, triangular are NIR. Open point are previously published data, while filled ones are from this paper. The decay slope of cobalt-56 (the product of nickel-56) in the V-band is plotted for comparison. The V-band lightcurve drops off much faster than radioactive decay would suggest. (Credit: Fraser et al. 2013). So if it wasn’t a core-collapse, what could cause such a bright transient? The authors suggest that the collision of two massive shells could have produced the right amount of power. They calculate that, depending on the conversion efficiency of kinetic energy to luminosity, only about 0.05 – 0.1 solar masses of ejecta moving at 7500 km/s would be required. Such an ejection is characteristic of the pulsational pair instability, a theoretical instability of very massive stars in the late stages of their lives. The pulsational pair instability happens when a star’s core temperature rises high enough that photons begin to spontaneously create electron-positron pairs. The sudden loss of pressure as photons disappear causes the star to violently contract and undergo explosive burning, which blows off its outer layers at high speed. The core will then cool and stop creating pairs; if the helium core is big enough, however, it will repeat the cycle. This creates a series of fast-moving shells of ejecta around the star that can collide with enough energy to power a transient like 2012b. Of course, there is another possibility: fallback. If a core-collapse supernova did occur, but the core of the star formed a black hole and the explosion was sufficiently weak, most of the nickel – which would have formed near the center – could have fallen into it. This is somewhat unlikely given the high velocities measured in the ejecta, but not out of the question. There are also other possibilities that could have caused the ejection of a large amount of material, such as a merge-burst event triggered by the merger of the LBV with a companion star. Ultimately, there is a simple way to tell if 2009ip has really exploded: if the ejecta continues to dim at its present rate, the original star will reappear in mid-April. If that star is gone, we can assume 2012b was the real deal. If it remains, however, transient 2012b just became much more interesting. SN1997bs’s True Identity: Impostor or Not? Super-luminous Supernovae Exploding diamonds in the sky Pair-Instability Supernovae: What might they look like? Elizabeth, great article. This is the part of astronomy I wish to get involved with after I graduate. I’m just down the way at Hartnell College and I hope to attend UCSC in the Fall of 2014. I do have an internship with Dr. Prochaska this summer. Any advice on how to get into this wonderful program? Congrats on getting the internship! If you’re working with X this summer, my advice is just to learn as much from him about the process of research as you can. Since it’s the summer there won’t be as many department events like colloquia as there might be during the school year, but go to department gatherings like morning coffee and try to get to know the other professors, grads, and postdocs in the department. That will tell you a lot about whether SC would be a good fit for you, and who you might want to work with if you do come here. And make sure to talk to X and/or Raja Guhathakurta about the process of applying for grad school. Good luck!